This was delayed because I just got more of the pictures to share. This year, we were able to do something we had never done before. 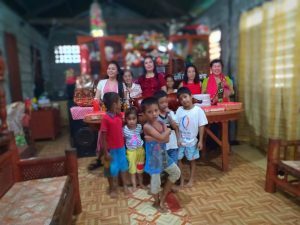 Through the use of a designated donation for this specific use, each of the children at the children’s home was given gifts specially chosen for them, each of the families was given rice and Goldilocks treats, and a meal served to the children, their family that they stay with and the volunteers. 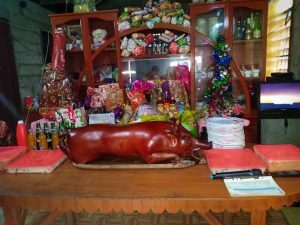 The meal was rice, lechon (whole roast pig) spaghetti, and macaroni. The budget for each child was $15. Many of the children had never had such a thing. While gifts are not the most important part of Christmas, we wanted it to be special for them. Each child was given an age appropriate toy or toys, shoes or clothing, and chocolate. The neighbors had to check out the celebration. Dindo who will be 6 soon watched gifts being passed out and very politely told Princess that he had been good also. A couple of the children were so excited that they were at a loss for words. The adults are left to right Inday, An English teacher and her daughter. Some of the volunteers and some children after setting things up. This year we are doing something different than we have done the last 11 Christmas season. 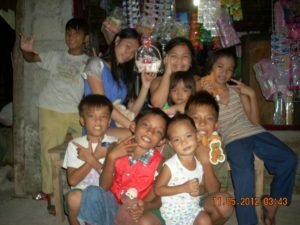 In the past, we had gotten a small toy along with things that the children needed. I remember when I was growing up how after my father got hurt that our gifts would be something like a pair of work pants and socks. Admittedly I needed them, but it wasn’t overly exciting. 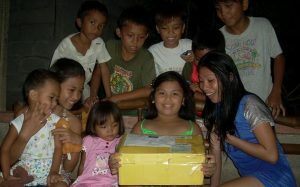 This year, I talked to Inday and we decided to get each of the children something exciting that they could enjoy. She had a budget of $15.00 for each child. Each of the families will get 5 kilos of rice and some Goldilocks treats. They are going to have a meal for all of them and then have their gifts passed out. Excitement with the Christmas box. I would love to see their faces as they get their presents, but they have promised to take a lot of pictures. They will probably have to go to Sindangan to the internet café to send the pictures because the signal is too weak in the village. I have included some pictures of previous years. Warning, don’t get confused at the date on the pictures, they never properly set the camera date. 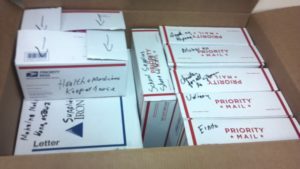 boxes packed and labeled for the recipients. I want to thank all our supporters for your continuing support this past year. I would love to share my pictures and tell you in person about our children and what is happening in their lives and that of the families. I am going to do something that I very rarely do. I am going to ask for help. I will explain what has been going on and then share the emergency. October has been a very stressful month due to health problems. Princess was taken by ambulance to the hospital after her mother found her fevered and delirious. 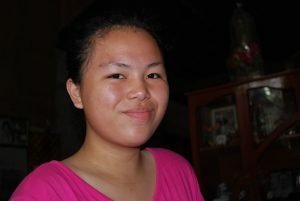 She had an internal infection and a case of Dengue Fever. She spent 6 days in the hospital on IV medication before she was well enough to send her home. Kevin and Leray both had cases of Dengue Fever, but they were taken to the doctor early and did not have to be admitted. The elderly man that volunteers his help, gave Inday the money for his medicine so that they could start treatment before they would have time to tell me what was happening and send funds. Gregory is and is the man who also helps often, and sleeps in front of the door most nights so if an intruder tries to come in, he will be awakened. This is a real problem as there have been many times that homes were broken into during the night while the residents slept. A neighbor that was moving to a different country gave Inday a larger dog of German Shepard mix. Gregory, the son, was feeding the dog and it bit him. The bite became infected. I insisted that he go to the doctor as he was running a high fever. I also told them to see if they knew if the dog had been given shots. No one knew anything about the dog’s shots, so I told Gregory to ask about rabies. The dog did, in fact, have rabies, so Gregory had to have 2 additional shots a week after the first one for infection. They were quite expensive. So, you can see why, with all the medical expenses of well over $1,000 USD, we are in a very needy state. Now to our current emergency. Gregory is Inday’s father , the grandfather, was walking by the side of the road this morning. He was hit by a tricycle and left unconscious by the roadside. 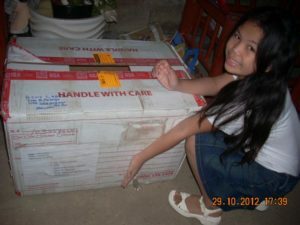 He was taken to Dipolog. This is a city that is about 2 ½ hours away. He is needing a scan to find out about the bleeding on the head. You may ask why we are helping someone who is not a child. 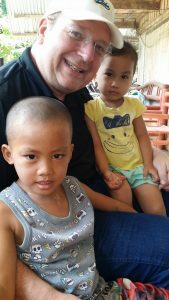 Not only has he helped with no compensation for most of the 11 years that we have operated the children’s home, but he also has often times helped out of his meager resources when children have been in need. He recently gave the money he had saved for his congestive heart failure medicine to be used for one of the children who had developed an infection. He has several bad teeth that needed to be pulled. 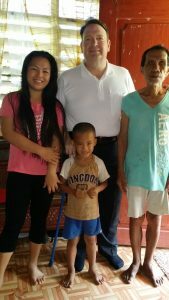 He took the money he had saved for that and gave it to Inday to buy medicine for Kevin and Leray when they had Dengue Fever so that they could start treatment immediately instead of waiting for it to come from the states. This early treatment helped keep them out of the hospital. So that is why we are asking for help. He has selflessly helped for all these years and it would be wonderful to help him in his time of need. The most recent update that I have had was this afternoon in Eastern time. He was in a non-responsive condition. His right hand was shattered and will need stainless screws to put it back together. He has a head injury that will require a CT scan to evaluate the damage to the head and to try to find out about the suspected swelling of the brain. The tricycle driver is being held in jail right now. He didn’t have lights so that he could see after dark. 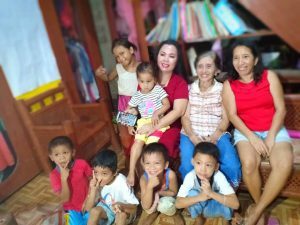 In the Philippines, when a person is in the hospital, often a family member or members will stay with them to help with things that are not done by the hospital staff. In the room where he is right now, the family is not staying in the room due to infection and the severity of his injuries. To save money so that they have more to help with his treatment and medicine, Inday, Princess, and Gregory’s son, were sleeping in the park under a tree. If you find it in your heart, your donation would be greatly appreciated. You can donate through our website. Thank you for your support and especially your prayers for this worthy situation. 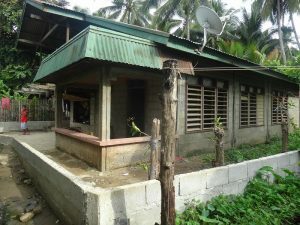 For your information, the funds donated for the building project will be used for that need. This is a separate need. One of the men who volunteers at the children’s home, doing heavy work and providing security in times of concern, was bitten by a dog that had no shots or any other type of treatment. His hand started swelling and within 24 hours, his whole arm was swollen. I found out about it on Sunday evening my time, when they contacted me to see if I had any suggestions to treat the injury. When I found out what was going on, I told them it was urgent to get him to the hospital. He didn’t want to go to get checked because he was afraid of injections. Please pray for his speedy recovery. He has a high fever and is delirious right now. His name is Carlito.